Walt Disney Pictures dropped the newest Ralph Breaks the Internet: Wreck-It Ralph 2 trailer Monday morning, earning high-praise from the internet — which just so happens to be the setting for the sequel as it re-teams Ralph (John C. Reilly) and Vanellope (Sarah Silverman) for an interweb adventure. The trailer sees the classic arcade game characters journey into the internet for the first time, where they're greeted by top-hit sites and apps like Google, Amazon, Twitter, IMDb, SnapChat, YouTube, and Facebook. The pair make their way to Oh My Disney — an actual Disney website — modeled after the Walt Disney Pictures logo, complete with magical Tinker Bell fairy dust effect. 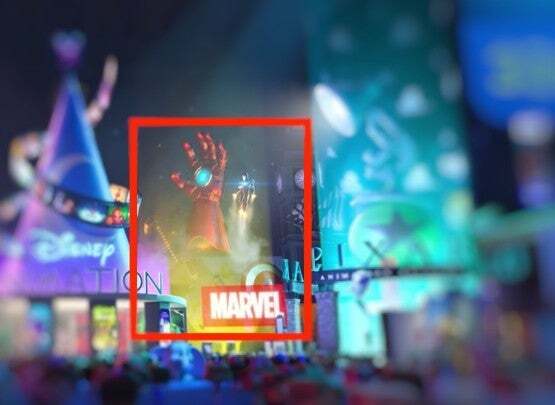 It's at Oh My Disney where Ralph and Vanellope encounter a cache of both classic and modern Disney princesses as well as portals featuring other Disney-owned operations like Marvel Studios, Star Wars, and Pixar Animation Studios — a busy scene packed with hard-to-spot easter eggs. While speeking to Eeyore of Winnie the Pooh fame, Vanellope is awed from an Iron Man flyover, who races past and takes his place in the Marvel-themed portal. There you can spot Iron Man’s unmistakable repulsor gloves as well as Captain America’s iconic red, white and blue shield alongside Thor’s mystical hammer, Mjolnir. There are plenty of easy to spot Star Wars easter eggs in the two-and-a-half-minute trailer, including the Millennium Falcon and the Death Star hovering above the portal to a galaxy far, far away. Stood near the exit is R2-D2, and soaring overhead in the middle of a dogfight are an X-Wing and a TIE fighter. The entryway also appears to resemble a Sandcrawler, the mobile fortresses that transported Jawas on the rough desert terrains of Tatooine as first seen in Star Wars: A New Hope. 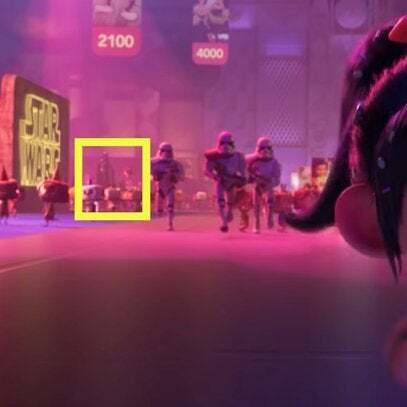 Not only is Vanellope chased off by First Order Stormtroopers, look closely and you can spot Darth Vader near the Star Wars logo. 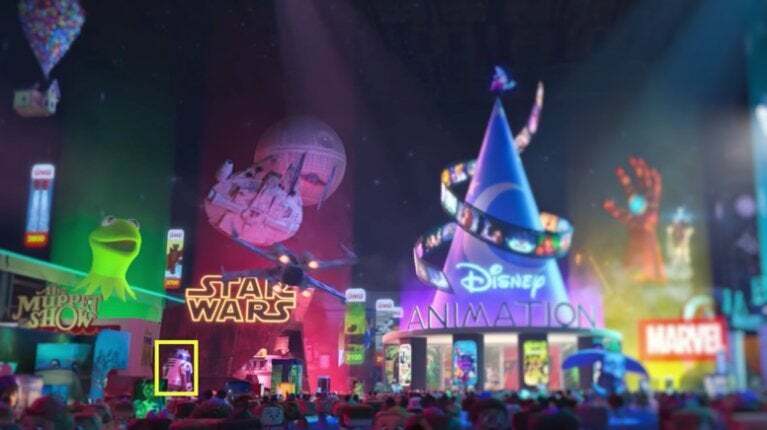 Aside from the obvious giant Kermit the Frog head overhead The Muppet Show portal, you can spot the logo from 2011’s The Muppets, Disney’s big screen revival of the beloved puppet characters that starred Jason Segel and Amy Adams. When Vanellope is pursued by Stormtroopers, look to the left of the screen and you’ll spot Beaker, the perennially hapless assistant to Dr. Bunsen Honeydew. Atop the Disney Animation portal is Mickey Mouse as he appears in Walt Disney’s 1940 Fantastia. Surrounding Sorcerer Mickey’s famous pointy hat are clips from iconic animated Disney productions, including The Lion King (1994), Lady and the Tramp (1955) and Alice in Wonderland (1951). To the left, near Kermit, you’ll spot a teaser poster for 2014’s Big Hero 6, and below that you’ll spot its starring heroes, Hiro Hamada and Baymax. 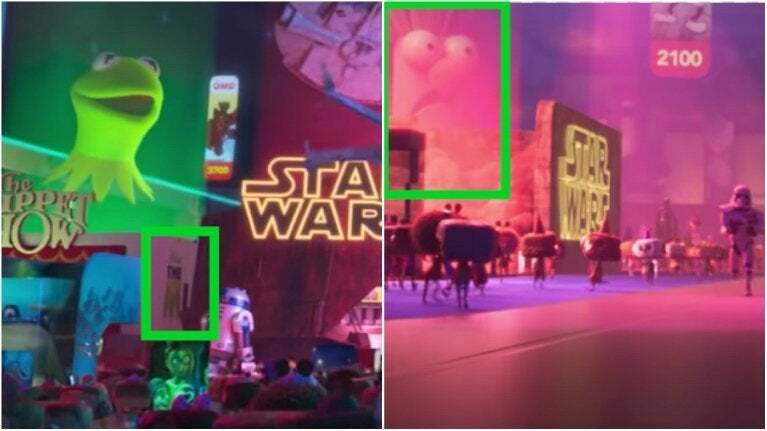 In-between Kermit and the Millennium Falcon is a shot from 2003’s Brother Bear, and to the right of that, in-between the Star Wars and Disney Animation portals, you can see a sliver of the ‘Hakuna Matata’ sequence from The Lion King as well as a peek at iconic 1928 Mickey Mouse short Steamboat Willie. Below them is a shot from 2016’s Moana. Adorning the walls of the Disney Animation portal are posters for Walt Disney classics Sleeping Beauty (1959), The Jungle Book (1967) and Cinderella (1950). In front of the portal is big-eared flying elephant Dumbo, and to the right you’ll spot Big Ben and the flying pirate ship from 1953’s Peter Pan and then the surfing sequence from 2002's Lilo & Stitch. On the other side of the room, during Iron Man's flyby, you can spot posters for Sleeping Beauty and Bambi (1942). The Pixar Animation Studios portal is modeled after the real-life Pixar Animation Studios entryway in Emeryville, California. 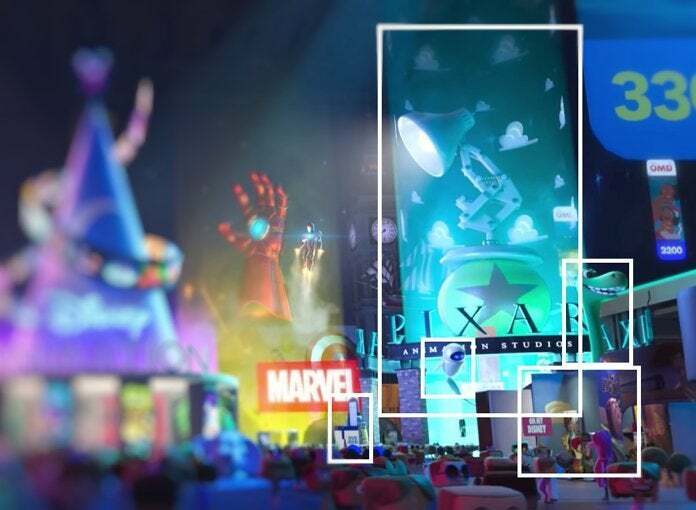 The portal is decorated with the familiar blue sky and white clouds wallpaper adorning Andy’s room in the Toy Story trilogy, and the hopping lamp mascot and Luxo Jr. ball from Pixar’s famous 1986 are represented. Stood outside the Pixar portal are Pixar characters EVE, from 2008’s WALL-E, and Arlo, the titular green dino of 2015’s The Good Dinosaur. On the bottom right you’ll see what looks to be a photo opportunity featuring scenes from 1995's Toy Story, Pixar’s first feature length film and the first-ever full-length all CG-animated film. On the left you can spot a scream canister from 2001’s Monsters, Inc., and on the other side of the room, during Iron Man's flyover, you can spot scenes from 2006's Cars and 2016's Finding Dory. The leading ladies of Disney’s Disney Princess line are seen interacting with fans (many of whom are sporting Mickey Mouse ears worn worldwide at Disney theme parks like Disneyland and Walt Disney World). Every living voice actress returned to voice their respective Disney character. When Ralph and Vanellope visit the Searchbar (powered by Knowsmore), the music might sound familiar to video game fanatics: its the same music from the Pokémon franchise, heard when your character heads into the Pokémon Center in Pokémon Red, Blue, and Yellow. Ralph Breaks the Internet: Wreck-It Ralph 2 opens November 21.